Remember the archivists’ rallying cry! Just today I opened a box that held Student Senate Minutes dated May 17, 1970…how timely! 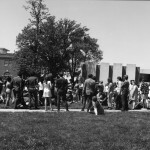 On May 4 of this month, we took part in a commemorative event for the 45th anniversary of the Kent State killings in 1970. Documentation for events on our campus that were recounted in that blog post were limited to the Argus, Wesleyana and a few photographic files. While researching that event, I marveled to discover that the IWU archives holds no Student Senate meeting minutes from March 22, 1970 until January 10, 1971. It sure would help us appreciate the Senate’s actions if we had the primary sources they created to consult! Don’t get me wrong, the news sources are great to have, but it’s these kinds of gaps that make anyone doing historical research a little crazy. So yes, it was good to see minutes in a recent donation, but it was a huge letdown to find that pages 2-15 of those minutes had been removed. We may never know why that happened, but on the very last page there is evidence that helps us understand a little more about the May 1970 student reactions in that turbulent month. 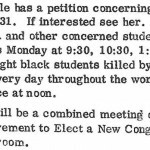 The first image below was scanned from the minutes and it contains an announcement that the Black Student Union was responsible for the walkout. From this brief note, we also find out why they felt compelled to walkout 14 days after Kent State. 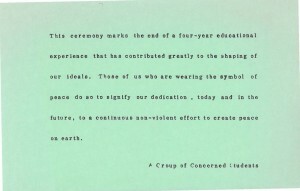 There was also a green flyer (image below) that explains the Peace Symbol students wore during Commencement in 1970–that event was also described in the previous post on the May 4th commemoration. These kinds of documents connect us with our past in tangible ways…stop by the archives if you want to see the real things someday! Announcement of Black Student Union as the walkout’s sponsor. 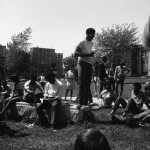 BSU sponsored walkout. 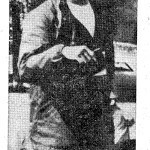 This attribution and the date were only recently discovered in the fragment of a Senate Meeting record. May 22 Argus, p. 7, the only news item that mentions other student shootings by the authorities that month and that anyone on campus reacted to them. 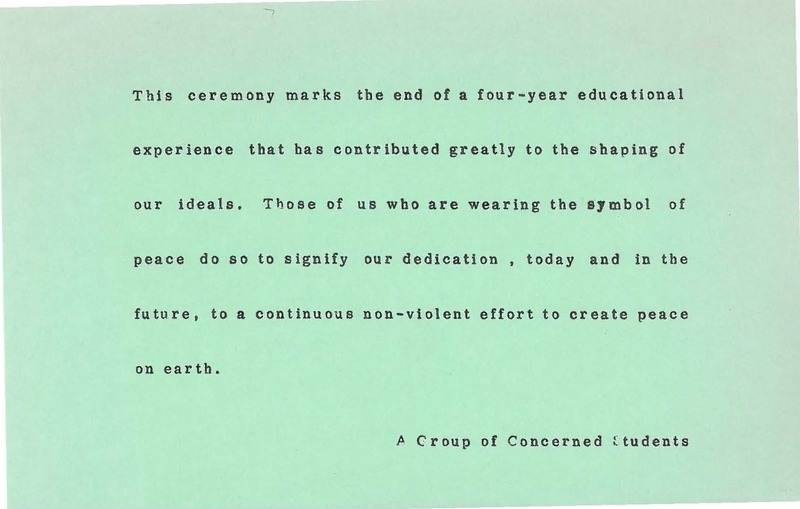 5×7″ flyer stating reason for wearing the peace symbol at Commencement.